First of all, the Stabyhoun population is very small in numbers. To keep the breed healthy, we need as much breedstock as possible in the Netherlands. It is hard enough as it is to to find enough owners willing to breed with their Staby. We can't really afford to loose any of them. The Staby's in the United States and Canada are generally lost to the breeding population in the Netherlands. Then there is the fact that most export puppies don't show up at the breeders day. Perfectly understandable because of the long journey and the costs involved, but still very sad because it's one less dog to judge if sire and dam contributed to the breed. And last but not least, my heart bleeds at the idea that I'm never going to see that puppy again. One of the great joys of a breeder is meeting the offspring at various occasions like breeders day, shows, clubmatches, organised walks and such. I'm selfish enough not to want to deprive myself of that joy. Sorry! Exporting to neighbouring countries is another thing. 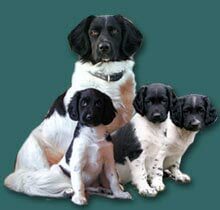 Dogs can still participate in the breeding program, show at Staby-associated occasions and contribute to the Dutch breed population.